$25K PRICE REDUCTION - 3 Bedroom, 2.5 Bath, PLUS large LOFT Home with 3 CAR GARAGE located on a PRIVATE CORNER LOT next to greenbelt. A Gardener's Dream from the front yard to the back with lots of fruit trees and your own green house. From the front entry, step down to a formal living/dining room with cathedral ceilings and lots of light from the two-story windows. Kitchen with lots of cabinets and separate kitchen nook area for eating overlooking family room with fireplace and slider to concrete stamped and brick-ribbon patio with lots of planters, fruit treas and more! Downstairs powder room and Inside Laundry room with Storage. Upstairs offers a large loft overlooking the living/dining room, large master suite with separate dressing area, dual sink vanity, walk-in closet, separate water closet and tub/shower with enclosure. Two secondary bedrooms and a hall bathroom with tile flooring. Marble tile flooring thru-out downstairs. Storage in 3 Car Garage! Located inside the neighborhood and walking distance to the Community's Private Pool/Spa, Tot Lot, Sport Courts, Picnic Area and Park. Award Winning School K-8 Arroyo Vista and Tesoro High School. 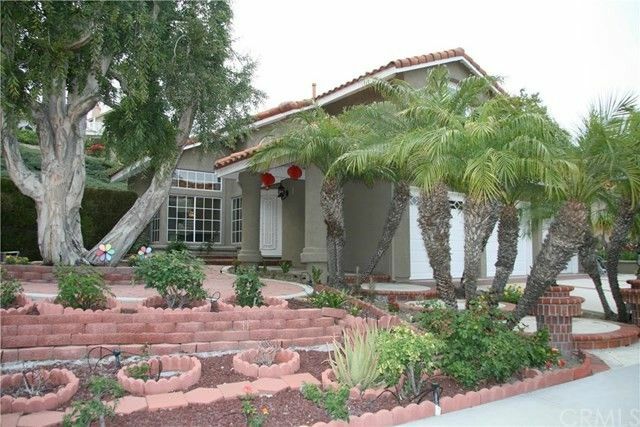 Centrally located and close to Fwy, Toll Roads, Shopping, Restaurants and More!